For those who haven’t had the benefit of a classical education (a favorite saying of a friend’s father) Au Coeur des Chocolates translates to Heart of Chocolates. And, Master chefs Shawn Williams and Doug Basegio’s explore this concept with extravagant results. Be prepared that the first thing you will do after opening a box of Au Coeur des Chocolates, is pick yourself off the floor. 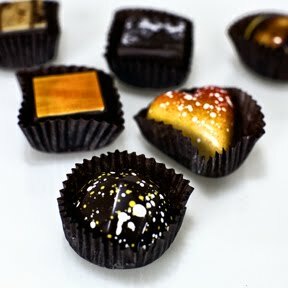 Because if you’re not knocked out by the incredible, smell of rich, wafting chocolate - so rich you could wear it, you will certainly be knocked out by the sheer beauty of the chocolates each as exquisite as a Sultan’s treasure. Savoring each chocolate made me feel like as if I were the star in my own movie conjuring up images, feelings and moods. 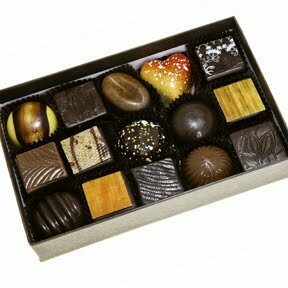 The first group of chocolates I savored were fruity and took me to some unnamed exotic locale, wearing something loose, possibly organic (but still immensely flattering) apparel and with a perfect, seamless tan. This is the kind of movie where one goes on vacation, leaves their deranged world behind, finds true love and more importantly discovers their true self. My selection for this particular fare, included the Passion Fruit, the Yuzu (if you had the benefit of a classical education, you would know Yuzu is a Japanese citrus fruit) and the aptly named Candied Orange Hazelnut Crunch. 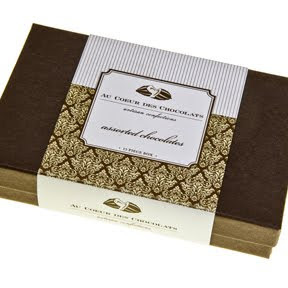 Each chocolate is bursts in your mouth with sensational, vivid, sparkling flavor. The Yuzu, was especially outstanding: light, refreshing and tart. Palet d’Or, Tahitian Dark Truffle and the Salted Caramel, take you to someplace entirely different, more of a film noir where the mood suggests some intrigue and mood lighting. Each truffle in this series explores the range and depth of chocolate. The Palet d’Or is made with Chefs Williams and Basegio’s favorite dark chocolate and is the perfect match for the exacting chocolate connoisseur, the aristocrat with the secret past if you will. And, while you might not consider the Tahitian Dark Truffle as a player a final feathery note of vanilla tells you not to underestimate this chocolate. My favorite though was the Salted Caramel. This is not an ordinary salted caramel that involves a basic caramel and salt. No. This is a smoky, buttery, silky caramel with a pinch of savory Maldon sea salt – the kind of chocolate that lurks in the shadows and is the key to your puzzle. While I have a great love for all cinema, my favorite types of movies are the ones that make you laugh – whether they are silly capers or targeted to 7 year old boys and girls. To me, there is nothing more meaningful to bringing a smile to someone’s face and the Caribbean Coconut, Crunchy Peanut Butter, Banana Caramel and Ginger deliver on the smile. The Caribbean Coconut is a sophisticated take with light coconut flakes, and the Crunchy Peanut Butter nutty and delightful. I was most taken with the Banana Caramel which is every bit as good as it sounds. This story line involves a banana cooked until it’s own sugars begins to caramelize, then has some additional caramel is twirled in and, if that were not enough, mixed with a rich, sinful chocolate ganache. The Ginger is one of the most beautiful chocolates I have ever seen. It is faceted like a jewel and then decorated with a sprinkling of tiny white and yellow dots. When I first saw it, my immediate reaction was to make some sort of excuse so I could hoard it somewhere forever and for my own, personal, selfish enjoyment. However, greed took over. Biting into the dark molded chocolate reveals a center ganache that is smooth and sensuous with a delicate taste of ginger and wild honey. It's always sad when the lights come on and the curtain closes but with Au Coeur des Chocolates, you can at least console yourself that you will always have the perfect ending. Enjoy the Vanilla Latte, a light coffee flavored chocolate or the Peppermint Dark Chocolate as your last bite, while you ponder where your chocolate experience will take you.